When Rico Rodriguez raided his first island nation in the original Just Cause, fans were entertained by a singular, satisfying objective: blow stuff up in the most exciting and ridiculous ways possible. Three games later, your goal remains largely the same, but new destructive tools, customization options, and the series’ largest physics-based sandbox yet deliver a steady stream of mayhem and hilarity. When I first started Just Cause 4, it didn’t make a great first impression. The main menu screen requires a hefty load time, and many cutscenes suffer from stuttering framerates and perplexingly low-res textures. The story those scenes convey also isn’t anything to write home about; Rico Rodriguez finds himself on yet another island that needs liberating from the Black Hand mercenary group, which has served as the antagonizing force in most of the previous entries. Add in some confusing progression and customization menus that take a while to wrap your head around, and I had some serious doubts if Just Cause 4 would live up to my previous enjoyment of the series. Those doubts didn’t last long once I began exploring Just Cause 4’s diverse and beautiful open world. One of the biggest criticisms lodged at Just Cause 3 was its stuttering and inconsistent framerate, and Avalanche’s number-one priority here was clearly the gameplay. Even when I was laying siege to the Black Hand’s most fortified strongholds, ziplining between attack helicopters and showering the battlefield with the debris of every radar dish, propane tank, and enemy vehicle I could set my sights on, the frame rate held up, and the visuals continued to dazzle. While players can find an arsenal of satisfyingly overpowered weapons strewn about every enemy stronghold, your most invaluable tool remains Rico’s grappler. The handy arm cannon allows you to flex your destructive creativity by suspending objects via giant balloons, tethering them together with cables, or turning pretty much anything into an improvised missile with rocket boosters. Rico’s grappling hook, parachute, and wingsuit also turn him into a veritable superhero, and make zipping around the island a breeze. Sticking a squad of enemy soldiers with airlifters and inflating them into the stratosphere isn’t the smartest way to win a ground conflict, but it sure is entertaining. Liberating Solis is slightly more involved than previous entries. Instead of just blowing up everything that’s painted red (which you’re still encouraged to do), Rico undergoes discrete missions to soften up each district before advancing the frontlines of the war, which is represented by endless clashes between the Black Hand and Rico’s Army of Chaos. These liberation missions become repetitive, but are augmented by three different chains of missions that feed your grappler upgrades. The main story missions provide further variety, and are also broken down into several chains based on biome-specific weather storms that have Rico chasing tornados and wingsuiting his way through sandstorms, blizzards, and deadly lightning storms (not recommended, by the way). All in all, Just Cause 4’s missions offer up plenty of manic fun, even if I was ready to never flip another circuit breaker once the final pocket of Solis was liberated. 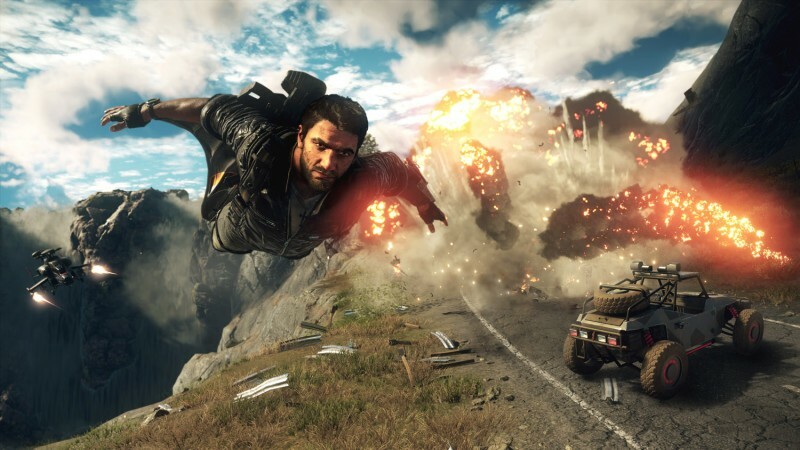 Just Cause 4 occasionally gets too difficult for its own good, bombarding you with swarms of enemies that have no qualms about taking potshots from afar. This was also an issue in previous entries, but the gunplay has improved; even the most bullet-spongy enemy can be downed with a few headshots, and generous checkpoints ensure steady progress through even the most difficult missions. Being able to commandeer an enemy helicopter and blow your attackers to kingdom come also helps stem the frustration. 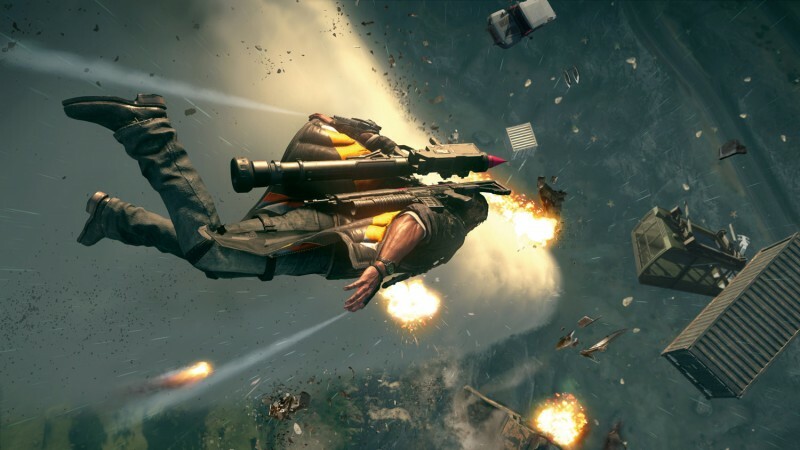 Most of my favorite moments in Just Cause 4 had nothing to do with the story missions, and instead emerged out of playing with Rico’s ridiculous toolset – like turning a dumpster into a humble airship with a couple of balloons and riding it across the island, or rigging the horses on a merry-go-round with rocket boosters and watching it spin out of control. If you can devise a stupid and dangerous use for Rico’s grappler, you can probably pull it off – and I’ve got a hard-drive full of hilarious videos to prove it. Just like any good sandbox game, Just Cause 4 gives you the freedom to make your own fun, and has kept me experimenting and entertained for hours after the credits rolled.